What an exciting week we’ve had! On Wednesday 22nd April, we attended the Free From Food Awards at the Royal College of Physicians in Regents Park, London. Around 300 Free From enthusiasts gathered to hear who would be awarded the prestigious awards for their products and, of course, who would be crowned the champions of the Free From World and be presented with Marble Mo, the FAIR Trophy for the Best Free From Product. Collecting our certificate for winning the Foods-to-go category from Free From Food Awards Patron Antony Worrall-Thompson. With such tough competition, we were hopeful for a mere mention at the ceremony, and were so excited when our Traditional Pork Pie won the ‘Foods-to-go’ category! With our new gluten and dairy free Steak & Ale Pie being awarded a Highly Commended in the ‘Meaty Ready Meals’ category too, we were on cloud nine by the time the final award, the overall winning product of the competition was announced. We were absolutely astonished when Michelle Berriedale-Johnson, the director of the awards mentioned that we were in the running for the prize, but when the room was filled with ‘pork pie’ murmurs when she asked the crowd who should win the competition and we were soon after announced as the winners, we almost fell to the floor! We made our way to the stage to collect Marble Mo, who was presented to us by patron of the awards Antony Worrall-Thompson and we were absolutely overwhelmed by the cheers from the crowds! It was such a proud moment for us, having worked so hard for three years to only dream of an achievement such as this. The winners! Check out all the fantastic winning products on Free From Food Awards website. We want to say a huge THANK YOU to all our lovely, loyal customers, who keep us very busy making lots of pies! Without your continued support, we would not be here today sharing this incredible news with you! 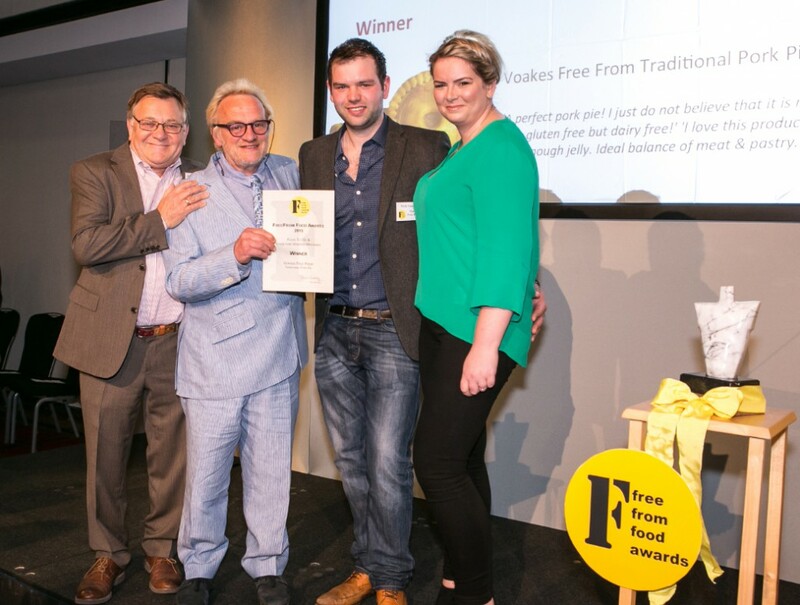 Success for Voakes Free From at the FreeFrom Food Awards! Voakes Free From is delighted to announce that two of our products were “Highly Commended” and another two were shortlisted in the prestigious FreeFrom Food Awards 2014. 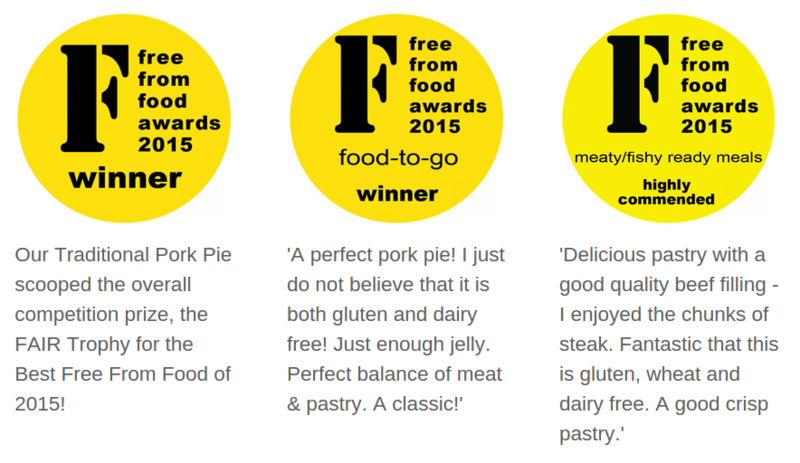 Voakes Free From Special Pie was awarded Highly Commended in the “Foods for Christmas” category. 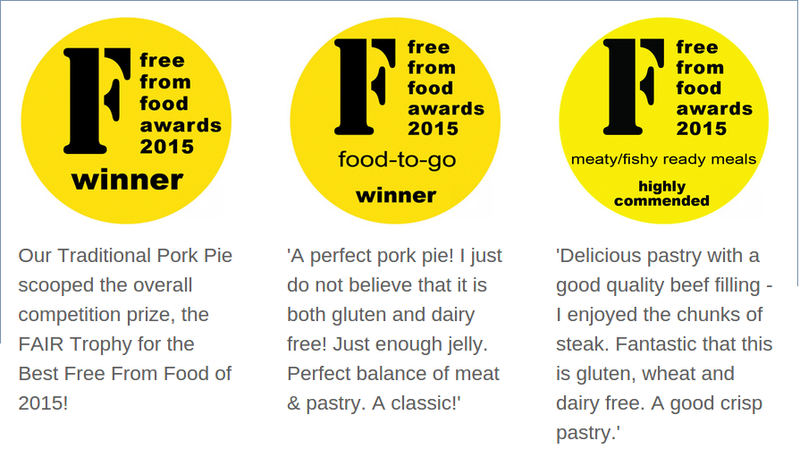 Voakes Free From Steak Pie was judged Highly Commended in the “Meat Based Meals” category. The freefrom market is now estimated at over £385m and a record number of products – more than 350 were entered into this year’s FreeFrom Food Awards. Each product was tested by a panel of expert judges earlier this year, with the winners announced at the Awards ceremony in London last night. 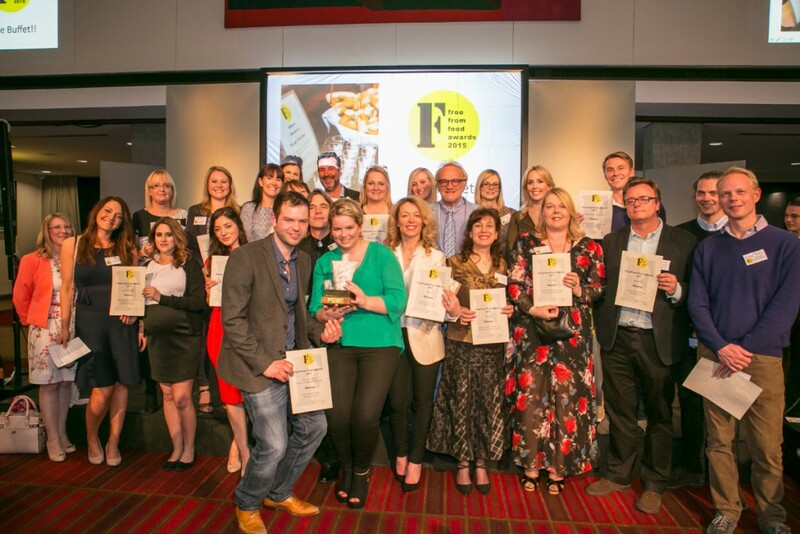 The judging panel comprised: manufacturers, chefs and cookery writers; dietitians and nutritionists; coeliacs and allergy sufferers, as well as freefrom and gluten-free bloggers. Between them, the judges tasted products from 16 categories including a number of new ones for 2014 such as breakfast and after dinner foods. The FreeFrom Food Awards have been instrumental in driving new product development and improving the quality and choice of freefrom foods that are available, and the products on the list this year highlight this success. Judging was therefore incredibly difficult but at the same time incredibly satisfying too. The judging panel comprised: manufacturers, chefs and cookery writers; dietitians and nutritionists; coeliacs and allergy sufferers, as well as freefrom and gluten-free bloggers. Between them, the judges tasted products from 16 categories including a number of new ones for 2014 such as breakfast and after dinner foods. While every care is taken to ensure the information provided on our website is correct and up to date, we are unable to accept liability for any incorrect information displayed. Please ensure you check the label on the product before you consume it, especially if you have a food allergy.